Smart tailoring and our superior two fold pure cotton material come together in this timeless formal shirt for a most luxurious effect. 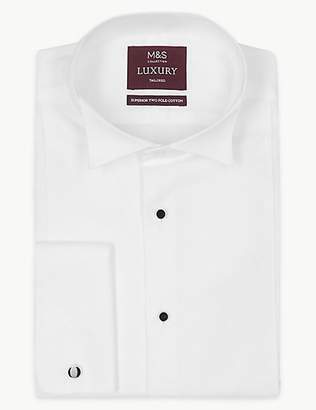 Shaped for a contemporary tailored fit, our dinner shirt showcases a winged collar that is perfect for teaming with a stylish bowtie, while the textured finish lends an extra touch of interest. Easy to iron for quick maintenance, this refined piece is a must-have for any sophisticated wardrobe. "Machine washable even at 30\u00ba"